“With 85 million baby boomers and 50 million Gen Xers, there is already a yawning generation gap among American workers–particularly in their ideas of work-life balance. For baby boomers, it’s the juggling act between job and family. For Gen X, it means moving in and out of the workforce to accommodate kids and outside interests. 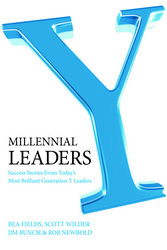 Now along come the 76 million members of Generation Y. For these new 20-something workers, the line between work and home doesn’t really exist. They just want to spend their time in meaningful and useful ways, no matter where they are”. Read the full TIME Magazine article here..